There are many vintage drivers that posses a great timbre, used in many legendary speakers but after many years their motor is demagnetized to a point that they lost their output and the impact on midrange and high frequencies. This is true especially with Alnico magnets since they are prone to demagnetization. Revitalizing these magnets can be very hard, it is for sure not something a DIY-er can do. In these cases converting the motor to a field coil motor can be a very sensible solution. 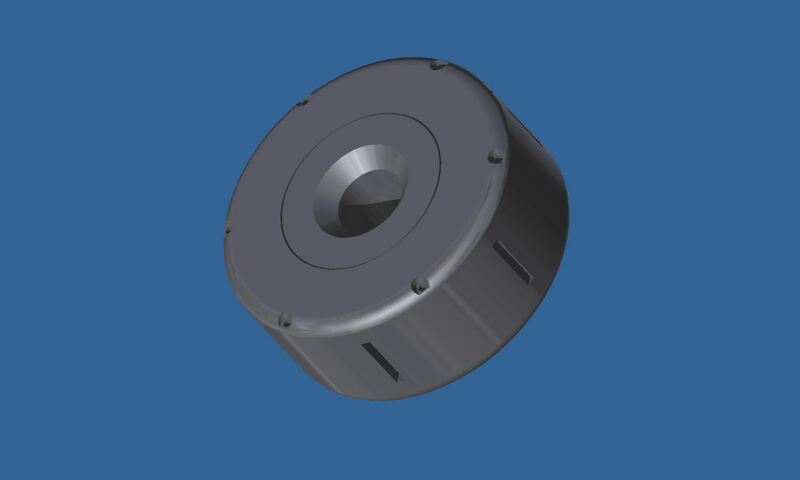 It will never demagnetize and it can offer other advantages such as adjusting the motor force for specific applications. Someone has a pair of JBL 2220H which he loves and uses them in a Front Loaded Horn. However, in this horn, the midrange above 400Hz is not very detailed and asked if somehow a field coil motor can spark some life in that band. 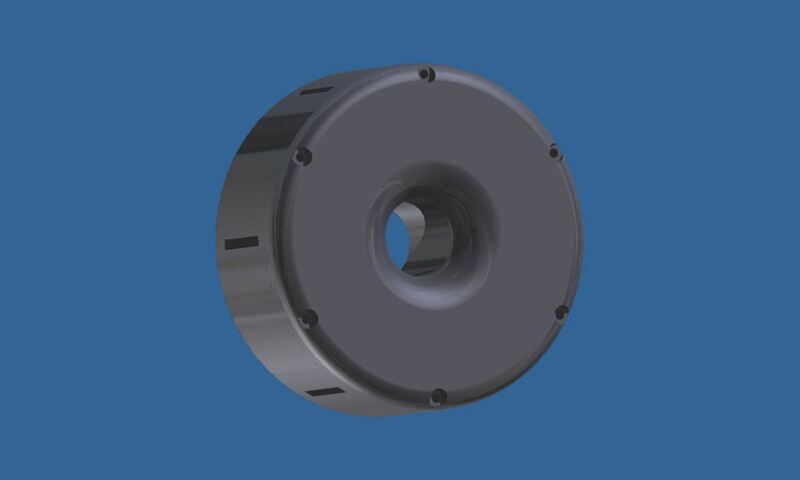 Output in this region is influenced primarily by mass of moving assembly (cone, voice coil, surround, spider, dustcap etc) and the strength of the motor. Since changing the cone mass would mean altering the timbre of the driver the only option is to change motor strength. If we increase the electro-mechanical coupling factor BL, we will notice a rising response characteristic with frequency. This is because the output of the driver will rise but lower frequencies will be tamed down by an increased impedance in that region. This is a very good characteristic for drivers intended to be used in Front Loaded Horns because it will compensate for the natural low pass filter of such horns. This LPF is created by the air trapped between driver’s cone and the throat of the horn. At low frequency this air has mass and all of it is pushed into the throat but as frequency rises the air becomes compressible acting like a compliance and not all the air will be pushed into the throat. This compliance is a reactive element and acts as the low pass filter. Fortunately our rising frequency response characteristic will compensate for this effect and equalize the system to a flat response. 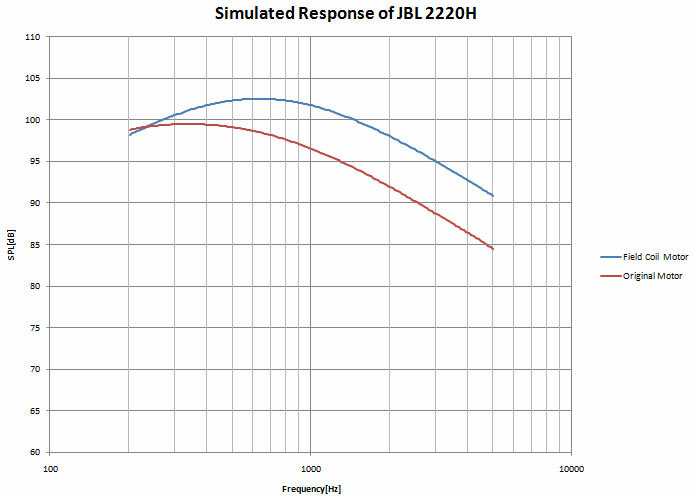 JBL 2220H has a strong motor already with a BL of 22.5 Tm, Re of 5.7 ohms and B of 1.15 T. Being a 15 incher however, there is room for a bigger one, a field coil motor. In the JBL specs sheet we see that the gap height is 9 mm and voice coil height is 7.2 mm so we are dealing with an underhung design with a ceramic magnet. The motor i am proposing is a 180mm in diameter and 80mm in height. It has the same 9 mm gap height but it can reach a flux density B of 1.6T with a 1010 steel structure. As we will see, this will boost the midrange frequency of the driver so that it will respond better in a FLH. 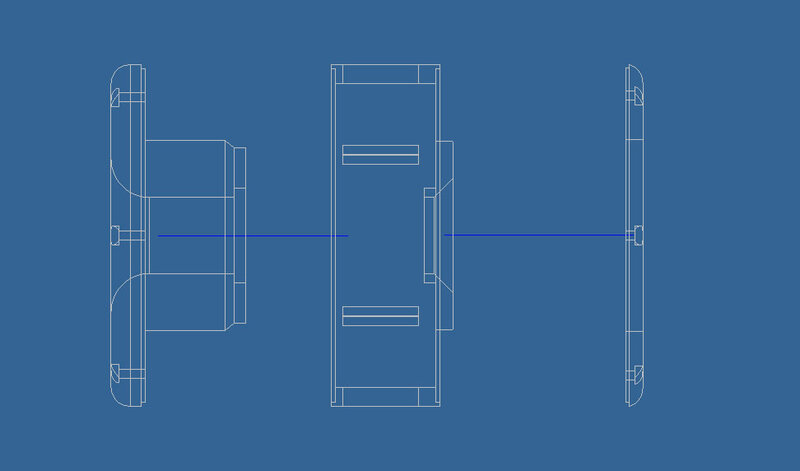 With a 4 inch (100mm) voice coil i considered a 40mm cooling vent with large flange to eliminate any noise. It also features a T shaped pole piece for field symmetry around the gap as you can see in the image below. The below graph shows the theoretical flux density curve with a 13 mm range, that’s +/- 2 mm outside the gap. In reality the value will be a little lower @ 1.5T due to imperfection of the joints between metal parts as opposed to the 1.7T on the graph. To determine the new BL we have to know the length of wire in the gap on the JBL 2220H. The original BL is 22.5Tm and a B of 1.15T, this means that L=22.5/1.15=19.5m. With the new motor we have a B of 1.5T and this results in a BL of 29.25Tm Very Powerful! The field coil used is a low voltage one <30V so that power supplies should not pose any problems. The graphs above were acquired with 26W delivered to the field coil. Considering careful ventilation this should not pose any heat problems. I simulated the new driver in a 100L closed box to see how the response compares to the original. The result is shown below. The response rises indeed to about 5-6dBs from 220Hz up. As you can see a field coil motor not only will solve the problems of old weak motor but it can also give you the ability to tune the driver to a specific application. By lowering the current in the field coil you can get to the original parameters of the driver. By not modifying the mechanical side, the cone, the suspension system we also maintain the original sound characteristic, the timbre of the driver. I hope it was interesting and thank you for visiting.